Home » General Health » Your Heavy Smoking Linked to Genetics? From a global perspective, smoking remains the number one cause of preventable death, suffering, and high morbidity rates. Smoking can cause untold damage to your lungs, upper respiratory tract, upper digestive tract, arteries, brain, skin, and eyes. Although smoking can cause such problems as chronic obstructive pulmonary disease (COPD), emphysema, and chronic bronchitis, it is also a major contributor to various forms of cancer involving the upper respiratory and digestive tracts. When people think about smoking, they naturally consider the link between smoking and lung cancer. Although this is a very logical way to think about the potential hazards of smoking, it is actually much more likely that you will suffer from the complications of atherosclerosis as a direct result of either past or present smoking behaviors. Now, a very large study conducted in Denmark involving more than 55,000 people has conclusively shown a direct link between premature death and smoking. However, the results of this trial indicate that it is a genetic variant in current smokers that can be quite influential in future risk outcome. The trial involved the study of 55,568 participants, 32,823 of whom were smokers. During the 10-year follow-up period, 3,430 of the subjects died. The study indicated that indeed current smokers did have an increased risk of dying prematurely. In fact, heavy smokers had a 75% higher risk of dying than participants of the same age who were never smokers. The trial also included a special gene that was isolated from the blood samples of current heavy smokers. 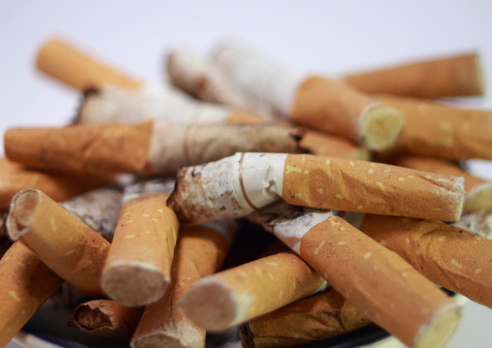 Although this genetic variation had no influence upon choosing to smoke or quitting smoking, it was very influential in the amounts of cigarettes consumed by current heavy smokers. The researchers also found that this gene variant is one that can be passed on to children. Those people who have inherited this gene from their parents were found to smoke an average of 20% more than those smokers who do not have this gene. This is yet another reason to seek the appropriate degree of professional help when trying to quit smoking; there may be genetic influences at play that can make quitting a very difficult proposition. Of course, the evidence from this research is not an excuse to continue to smoke, suggesting that because it’s genetic in your case, you simply can’t help it. You can with the proper help. And you can attain better health again as a result of your decision to quit smoking. If you are a current smoker, I urge you to take charge of your health and seek help to quit this terrible addiction immediately. “Large-scale study focuses on heavy smokers,” ScienceDaily web site, August 25, 2014; http://www.sciencedaily.com/releases/2014/08/140825100039.htm?utm_source=feedburner&utm_medium=feed&utm_campaign=Feed%3A+sciencedaily+%28Latest+Science+News+–+ScienceDaily%29. Rode, L., et al., “High tobacco consumption is causally associated with increased all-cause mortality in a general population sample of 55 568 individuals, but not with short telomeres: a Mendelian randomization study,” Int. J. Epidemiol. June 6, 2014; doi: 10.1093/ije/dyu119.